The sixth tropical depression of the Eastern Pacific Ocean formed on July 15 and was captured in an image from NOAA's GOES-West satellite, see below. The image NOAA's GOES-West at 1500 UTC (11 a.m. EDT) showed the center of Tropical Depression 6E (TD6E) about 370 miles (595 km) south-southwest of Manzanillo, Mexico. NOAA manages the GOES series of satellites. 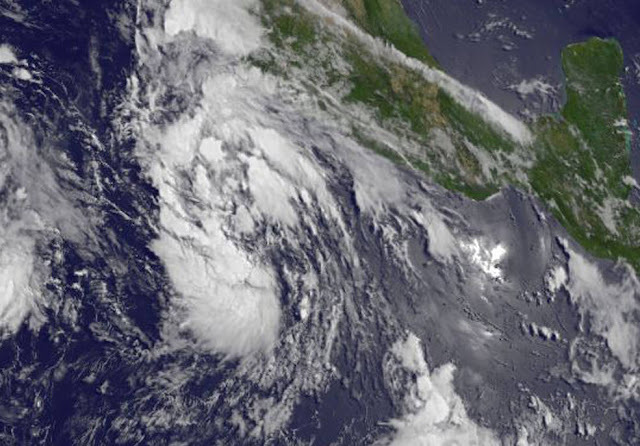 The image from GOES-West at 1500 UTC (11 a.m. EDT) showed the center of Tropical Depression 6E about 370 miles (595 km) south-southwest of Manzanillo, Mexico. Strengthening is expected during the next 48 hours, and the depression is forecast to become a tropical storm early Saturday. The estimated minimum central pressure is 1007 millibars.